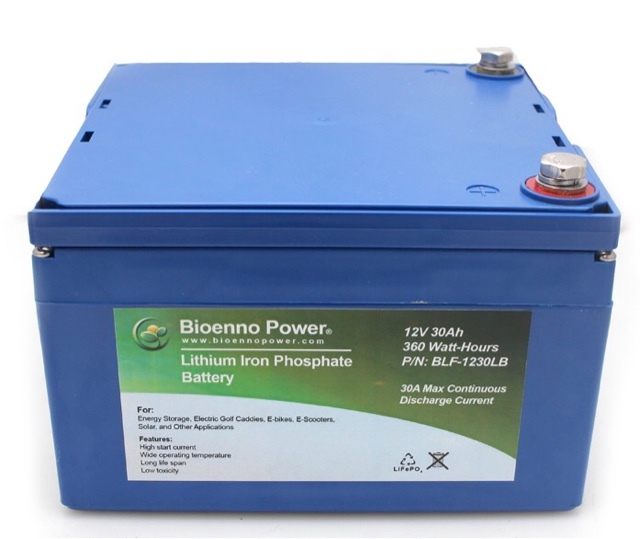 Above is a picture from the Bioenno website for my 12 volt 30 amp hour LiFePo4 Battery. Note: I am not affiliated with Bioenno in any way, and receive no compensation for my review of their product. I encourage you, after reading this, that you do your own research into the technology and manufactures/suppliers and come to your own decision on what works best for you, and who you buy from should be based on your independent research. I have been on the road for three weeks so far of my 2017 Travels, and I'm ready to report on my Prius House Battery upgrade to LiFePo4 Battery, from Lead Acid Gel Cells. My friend David, who full-times in his Prius, said to me at the 2017 RTR; "You nailed it with a battery for small vehicles." I hadn't had the time to take a retrospective view of my new LiFePo4 house battery design, and in the following days at the RTR, what he said to me sunk in. While looking at all the car, van, and truck dwellers, I realized we all had something in common. That was, lack of space for house battery, little time for maintenance of it, no ability to easily vent it general lack of knowledge of how to care for it either. I don't want to get too technical here, as it isn't necessary to make my points. My goal is to take the science out of using LiFePo4 in small vehicles. It really comes down to cost, not fear of the technology, as it relates to the many benefits of LiFePo4. This blog post is why I believe that using a LiFePo4 Battery is preferable over Lead Acid Battery Technology. 1. Off Gassing / Venting - I live in my Prius for 4 months a year, and although at low charge rates on Lead Acid batteries do not generate large amounts of off gassing, when you work to bring them up to full charge or quick charge Lead acid they do off gass. The reason I went with Gel Cells initially for my Prius house battery is for their minimal off gassing. AGM Batteries also have some limited off gassing when charging. 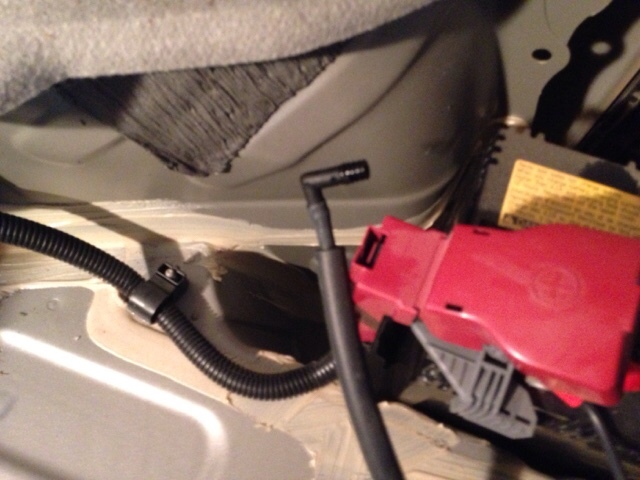 A small tube is applied to the 12 volt AGM Prius battery to address this. Wet cells are most susceptible to off gassing and why on manufactured RV's they are in a vented cabinet. This off gassing issue is why a number of people who put batteries in the passenger compartment use AGM Batteries, as a way to minimize the risk. As most vandwellers will tell you all risks are manageable, so off gassing is something that many manage and do well at it on the road. Note: Gel Cells, AGM, and Wet Cells are all Lead Acid Batteries. Also note that I do not know of anyone who has had problems with off gassing. I do know a number of people that are sensitive to chemicals and it may be a concern for them. LiFePo4 do not off gas when normally charging. They do have pressure relief point that is used in emergency typically when it overheats. I purchased my LiFePo4 Battery with a protection circuit to shut down if it gets too hot, thus eliminating my concern about a thermal problem. 2. Battery Orientation - Lead Acid Batteries have to be oriented in one direction. My LiFePo4 is actually upside down as the space I put it in on the left rear drivers side had a dip that didn't make the space flat and quite large enough for my LiFePo4 Battery. Since I had made a protective plastic cover for the exposed terminals, the height of the protection allowed me to flip it over and it sits flat in the space. 3. Charge Cycles - Here we have to use specifications as I don't have the testing to support any claim. Lead Acid Batteries have charging cycles in the hundreds. I'm talking about wet cells, and seeing 500 charge cycles published, but this is for a properly maintained battery. LiFePo4 has thousands of charge cycles. From what I have seen published 2000 charge cycles can be expected and there is no maintaince to follow. In full disclosure it could be much higher for number of charge cycles, but there is a spec that shows that if you fully deplete the LiFePo4 battery as your way of knowing when to recharge, the number of charge cycles is reduced closer to 2000. I charge my LiFePo4 way before fully depleted and I consider the battery an investment and not just an expense. The thought is similar to my Engel compressor fridge. It was $860.00 delivered and I'm on my fourth year of using it. 4. Weight - Those of you that have moved Lead Acid batteries around know they are heavy. For me my one LiFePo4 30 ah battery weighs in at 8 lbs and is just over half of the weight of the 3 8ah (24 ah total) gel cells I had before the LiFePo4 battery. 5. Size - My 3 8ah gel cells consume almost identically the space as my LiFePo4 does. The LiFePo4 is a tad bigger in total volume of space. Above is a picture of my LiFePo4 in the same space as the Gel Cells in the picture below. 6. Available Amp Hours - Where LiFePo4 shines is in available amp hours. Take my example of replacing 3 12v 8ah batteries for a total of 24 amp hours, and consider that generally only 50% of the Lead Acid Battery is available before you start to degrade the battery between charges. Therefore, I only had 12 amp hours available for usage on the Lead Acid Gel Cells. I discussed that the space consumed for these 3 batteries was about the same as the LiFePo4 Battery. Now consider that you can get 80% usage out of a LiFePo4 battery. My 30 ah battery that took the place of the Lead Acid Gel Cells will get 27 ah out of the same space. In fact Bioenno says it is possible to get up to 90% out of their battery. I generally tell folks I get 28ah of battery from my 30 amp hour battery. 7. Maintenance - Most people I know that have Lead Acid Batteries as house batteries don't care to maintain or forget to maintain them. Checking water levels may not be easy if your battery is in a compartment where you can't see the fill caps. You may be mobility impaired that prevents you from articulating in a position to get to them as Lead Acid batteries are down low and often under things. Some folks advocate checking the specific gravity of the Acid in each wet cell as a way to know you are fully charged. For the average person it may be beyond what they want to do on a regular basis. 8. Cost - Lead Acid Batteries are cheaper than LiFePo4 Batteries. Lead Acid are better known and don't have the mystique that LiFePo4 Batteries have. Remember when considering cost that the LiFePo4 battery having 80 usable captivity over Lead Acid is important. Also that it can be recharged thousands of times. 9. Control Circuitry - I purchased my LiFePo4 from Bioenno after engineering my solution and many emails back and forth with tech support. The internal circuits protect the LiFePo4 Battery from things like overheating, over discharging, short circuit, low voltage, and others. Mine also balances the individual cells that make up the LiFePo4 battery for greater longevity. People with Lead Acid batteries often try to install low voltage detection or watch a voltage on a volt meter, like I did when I had Gel Cells. I can tell you I don't worry anymore with my LiFePo4 Battery. If I forget the battery it will auto shutoff to protect itself from being harmed. If it gets too hot it will shut off and not have a runaway thermal condition like You may have seen in the past in the news where the older technology started fires. I wanted all the protection I could get in my LiFePo4 battery. Note: There are many Lithium battery Technolgies with new ones coming along. They sell Lithium drop-in replacements for Lead Acid batteries. They are not the battery I bought for my Prius house battery. Even LiFePo4 Batteries are not all with protective circuits. This is why I've done the research and have shared it on my blog. I believe in the protections offered by the internal circuits I have. 10. Charging Is Specific To Chemistry - All chemistries should be to be charged correctly for longest life. Lead Acid batteries have 3 chemistries and each should be charged at their specific charge voltages. Even with Lead Acid wet cell technology, each manufacturer can give specific charge voltages they recommend for their battery. To meet these charge voltages it generally means that a specific charger and if using solar a specific charge controller that is programmed to the battery specifications. From what I can tell most people do not look up the specifics of their battery's charge requirements and live with the results they get from charging off their alternator, built-in RV charger like I did when I had a Class B. My LiFePo4 battery has a spec of 4 amp hour charge rate. I found this low rate as unacceptable, and after working with Bioenno, I was told that the battery I chose could charge at 10 amps although spec says 4 amps. Bioenno warranties their battery and they confirmed my warranty is in effect charging at 10 amps because the charging circuit inside the plastic housing of the LiFePo4 battery had been updated to a 10 amp charging circuit and the specs were not updated. a. 10 amps with LiFePo4 specific charger either through 120v shore power or 120v from a 400 watt pure sine wave inverter off the Prius 12 volt battery. Charging at 10 amps allows me to fully charge in less than 3 hours. b. 4.5 amps with my folding 60 watt panel through a 20 amp MPPT LiFePo4 Charge Controller. Note: I bought a 20 amp charge controller in stead of 10 amps per the battery spec to allow me to expand my house battery setup in the future. For now I do not charge over 4.5 amps as the panel wattage limits the amps to the battery. If you were to buy a setup like mine you would only need a 10 amp solar charge controller. 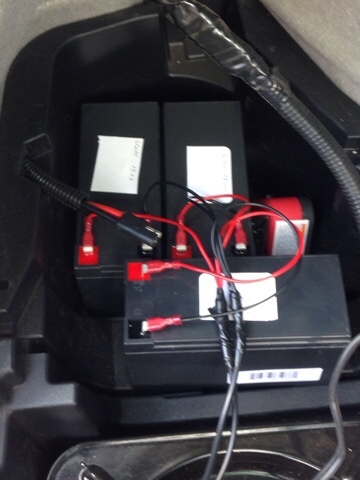 c. 1.5 amps with a 12 volt D.C. Charger directly from Prius 12 volt circuit. Although this is a light charge it is enough to maintain my Engel compressor fridge and still charge the LiFePo4 battery slowly. I am still looking for a more robust D.C. To D.C. LiFePo4 charger that would charge at least 4 amps up to 10 amps so I can eliminate the inverter charger. Right now with the three ways I can charge my LiFePo4 battery, I was good the first week at the RTR when the inverter was not working, and I got by with solar and the 1.5 amp D.C. To D.C. Charger until my new inverter arrived. 11. The Choice Between Lead Acid and LiFePo4 - For me it was my lack of knowledge that kept me from moving to a LiFePo4 battery before now. I was fearful to spend the money and make a mistake. I was concerned about "the lithium scare". I lacked the knowledge to design a complete solution. Based on my concerns I know now why others generally don't move to Lithium battery technology. I had to put myself through a knot hole to learn what I needed to have a system that would work for me. The good news is that I have done the work to research and design a solution that can work for all small vehicle dwellers. My system is not the best for high (greater than 10 amps) current usage. A different system would need to be designed, for the ability to charge LiFePo4 batteries at high current, say 60 amps to run large appliances. So my solution is not for everyone, but is scaleable to 100 - 200 watt solar panel systems, but you will be limited by charging a 100 amp LiFePo4 battery with the control circuitry to 15 amps. If you want faster recovery charging for solar there are other LiFePo4 companies and products without internal control circuits to achieve this. This post is only for small vehicle LiFePo4 solutions as space is an issue along with space on roof for fixed panels. Note that you can charge the LiFePi4 battery I have at 10 amps, that means it will work well with up to a 120 watt panel. 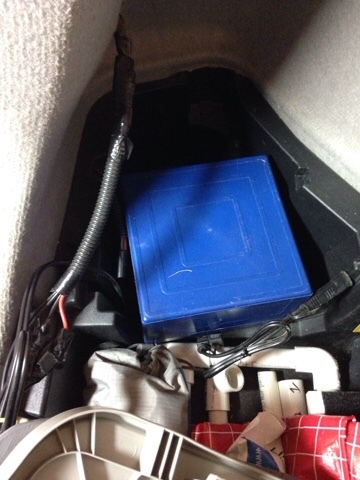 Below are links of my builds of how I tested the LiFePo4 and eventually installed it in my Prius. Here is my post on testing and migrating from Lead Acid Gel Cells. Footnote: The internal control circuits on the battery I chose prevents connecting these batteries in series or parallel. There are other LiFePo4 batteries for this purpose or just a larger battery with these control / protection circuits. Here is the detailed explanation from Bioenno's website. Great post, Brent! This page would be an excellent resource for many people in small vehicles. If you wanted more people to see it, I'm sure that Bob would love to use it as a guest post. I was amazed at how many people recognized my camper from my guest post. Thank you for your review.The Australians appear to use DC to DC charging frequently and have more options but expensive. I hadn't thought about looking into Australia for a D.C. To D.C. Charger. My preference would be at least a 5 amp LiFePo4 charger that I could replace the 1.5 amp one with. This would then be a decent charge that one could generally go without an inverter and 120 v LiFePo4 charger for small vehicle living. Could you list the exact devices you use for charging your battery in the car and from the wall? ... In case I didn't want to do the research and try to pick them out for myself.